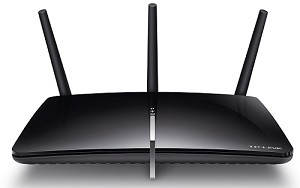 TP-LINK's Archer D7 AC1750 Wireless Dual Band Gigabit ADSL2+ Modem Router is a combined wired/wireless network connection device with integrated wireless router and ADSL modem, reducing hassle of configuration and saving space. Coming with the next generation Wi-Fi standard - 802.11ac, 3 times faster than wireless N speeds, Archer D7 delivers a combined wireless data transfer rate of up to 1.75Gbps. With 1300Mbps wireless speeds over the crystal clear 5GHz band and 450Mbps over the 2.4GHz band, the Archer D7 is the superior choice for seamless HD streaming, online gaming and other bandwidth-intensive tasks.